The largest full moon of 2013, a so-called “supermoon,” will light up the night sky this weekend, but there’s more to this lunar delight than meets the eye. On Sunday, June 23, at 7 a.m. EDT (1100 GMT), the moon will arrive at perigee — the point in its orbit bringing it closest to Earth), a distance of 221,824 miles (356,991 kilometers). Now the moon typically reaches perigee once each month (and on some occasions twice), with their respective distances to Earth varying by 3 percent. The March 19, 2011 supermoon was 221,566 miles (356,577 kilometers) away from Earth. The last time the full moon approached so close to Earth was in 1993. It was about 20 percent brighter and 15 percent bigger than a regular full moon. Supermoon over Münster, Germany, 19 March 2011. A supermoon is the coincidence of a full moon or a new moon with the closest approach the Moon makes to the Earth on its elliptical orbit, resulting in the largest apparent size of the moon’s disk as seen from Earth. The technical name is theperigee-syzygy of the Earth-Moon-Sun system. The term “supermoon” is notastronomical, but originated in modern astrology. 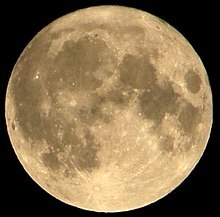 The association of the Moon with both oceanic and crustal tides has led to claims that the supermoon phenomenon may be associated with increased risk of events such as earthquakes and volcanic eruptions. However, the evidence of such a link is widely held to be unconvincing. The next occurrence will be on 23 June 2013. This full moon will not be only the closest and largest full moon of the year. It also presents the moon’s closest encounter with Earth for all of 2013. 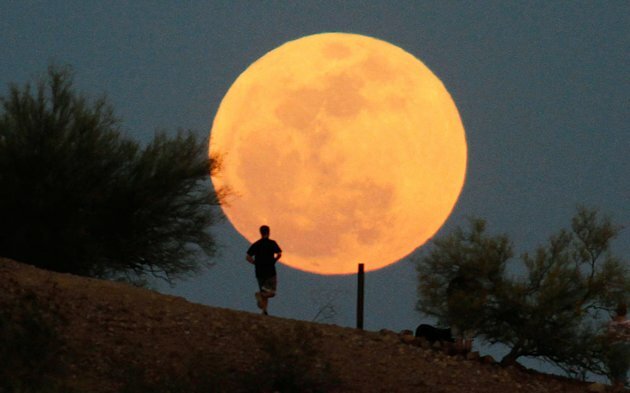 The moon will not be so close again until August 10, 2014. Usually the variation of the moon’s distance is not readily apparent to observers viewing the moon directly. When the perigee moon lies close to the horizon it can appear absolutely enormous. That is when the famous “moon illusion” combines with reality to produce a truly stunning view. For reasons not fully understood by astronomers or psychologists, a low-hanging moon looks incredibly large when hovering near to trees, buildings and other foreground objects. The fact that the moon will be much closer than usual this weekend will only serve to amplify this strange effect. So a perigee moon, either rising in the east at sunset or dropping down in the west at sunrise might seem to make the moon appear so close that it almost appears that you could touch it. You can check this out for yourself by first noting the times for moonrise and moonset for your area by going to this website of moonrise times by the U.S. Navy Oceanography Portal. Editor’s note: If you snap an amazing photo of the Sunday Supermoon and you’d like to share it for a possible story or image gallery on SPACE.com, please send images and comments, including equipment used, to managing editor Tariq Malik at spacephotos@space.com. Joe Rao serves as an instructor and guest lecturer at New York’s Hayden Planetarium. He writes about astronomy for Natural History magazine, the Farmer’s Almanac and other publications, and he is also an on-camera meteorologist for News 12 Westchester, N.Y. Follow us on Twitter, Facebook and Google+. Original article on SPACE.com.